Bainfield have a good recent record of title success in the gents Scottish indoor bowls Triples Championship so hopes are high that their 2015 campaign, which starts with the playdown action this weekend, will bring further celebrations. The challenge from the only indoor bowls club left to represent the Edinburgh Banner is in the hands of seasoned campaigners Graeme McIntosh, Alan Brown and Barry Hill, who won their domestic title at the expense of Craig Paterson, Craig Moss and Paul O’Donnell. The O’Donnell-skipped trio won the National title in 2009 and 2010. Brown – currently serving Bainfield as team manager in their premier league campaign – won 18 caps in between 1990 to 1995 and in 1989 skipped Bainfield to the national Fours title. Hill and his front two compete in the section of the draw being played at West of Scotland IBC and the trio launch their campaign tomorrow in the prelim round at 9.30am against Fintry. Balbardie IBC are yet to make a title-winning impression in the event and their latest hopes are invested in a stalwart trio of Colin Fraser, Andy Forrest and Jim Speirs, who open in the prelim round against Irvine. If Bainfield and Balbardie progress they will meet in the first round proper while also in close proximity is the Midlothian triple of Jamie Hanlon, John Stevenson and Kevin McDougall. Perth IBC is another of the venues and heading there are East Lothian trio Mark Johnston, Billy Mellors and Derek Oliver, with Bryan Copper, Stuart Johnston and Mark Allison representing West Lothian IBC. EL have captured the title on four occasions, including when Mellors skipped them to victory in 2007. The 39-cap star is bidding for a hat-trick as he skipped Andy Barclay and Andy Jeffrey to Edinburgh IBC’s triumph in 2003. 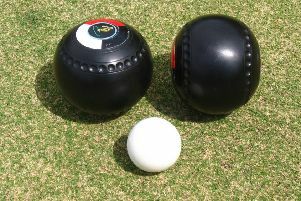 Mellors plays as middleman, subbing for bowls legend Willie Wood. Combined with the cap experience of Johnston (three) and Oliver (18), the trio are serious challengers.